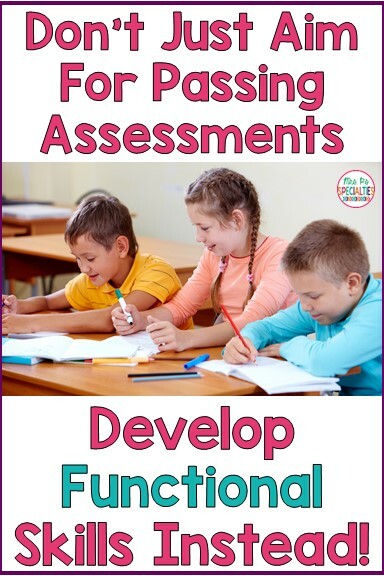 Moving Past Mastered Skills Towards Functional Skills | Mrs. P's Specialties! Did you read the title and think, "What's the difference?" 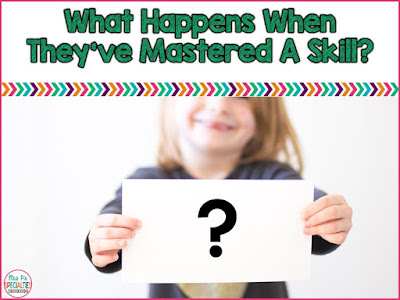 Students mastering skills is good, but what is more important is developing functional skills. Functional academic and life skills are skills that can be used across settings, people and materials. It's a great thing when students master a skill or meet a goal, BUT that can't be the end of the skill training. We need to be testing or assessing skills throughout the school day with different people and materials. If the student can only add while sitting at the math table with his teacher using the same manipulatives and materials that he has been using since he started adding, then it is NOT a functional skills. 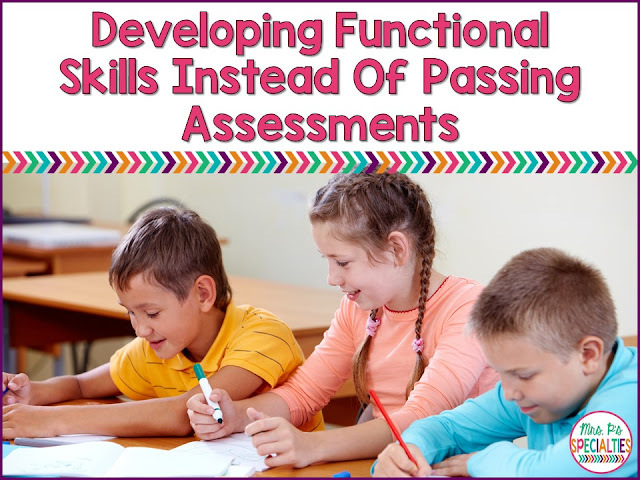 Functional skills are those that you can generalize across your day and use in a variety of situations. For most of my students, this doesn't come naturally to them. Therefore, our teaching needs to be specifically targeting generalization to help students be more functional. We can do this in a variety of ways. In my program, we begin working towards generalization fairly quickly. My students need direct instruction to learn new skills. They learn best in a 1 to 1 setting. As soon as the student begins showing signs of understanding the skill or concept, we start adding the skill to the student's center work. During centers, we use different materials and it's no longer in a one to one setting. Once students are practicing in direct instruction and centers, we begin to target it in different parts of the school day. Be clever and creative... where does the students go across the day? For example, could the skill be added to morning meeting, snack time, a therapy, etc.? For most skills, the answer is "Yes!" Direct instruction: work on the skill in a one to one setting, but change manipulatives weekly. with counting out a given set. PT: Student picks a number, identifies the number and then does that number of exercises that he does in order to meet his PT goals. Centers: A game where the student has to count as he moves spots, or gives out cards, etc. Morning meeting: Student counts the number of days, puts up the right set of coins for the day, etc. Academics can be weaved throughout the day! Not only will this help students generalize their skills, it will build in higher practice repetitions which leads to progress quicker. To read more about generalizing skills, click the picture below or click HERE. 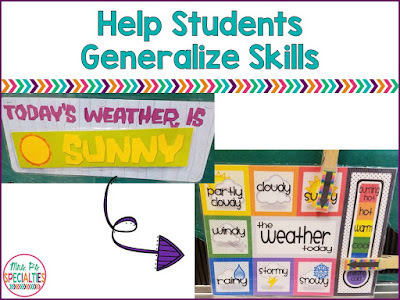 Want more ideas for helping students master skills? Click the HERE or the picture below.